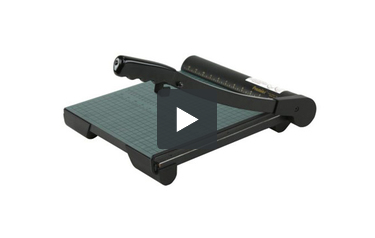 The Premier Heavy Duty 12" Wood Paper Trimmer is ideal for schools, churches and businesses. Whether you need to cut flyers, covers, documents, promotional materials of items for scrapbooking, the Premier W12 heavy duty fiberboard trimmer will work great. The W12 Premier Heavy Duty 12" paper trimmer has a heavy duty 3/4" thick base and includes a high quality self sharpening stainless steel blade that is capable of cutting up to 20 sheets at once, with a 12" cutting length. The Martin Yale Premier W12 is ideal for cutting paper, mat board, cardboard, film, tissue and textiles. Plus, it includes several great safety features to keep you safe when cutting. Check out the Martin Yale Premier W12 heavy duty fiberboard trimmer today. Dimensions: 18.88" x 14" x 3.50"
Welcome to MyBinding video. Today we look at the Premier W12, a heavy duty 12-inch wood paper trimmer by Martin Yale. The thick wood base, self-sharpening blades, and a permanent grid in English and metric will make the truest cuts on the Premier W12. Release the safety latch just below the handle. The W12 can handle up to 20 sheets of 20lb paper per slice. That was ten and here's 20, no problem. That's Martin Yale's Premier W12. For more demos, reviews, and how to's on this product and many more, check out MyBinding.com. If you often need to trim multiple sheets of paper at once, you should invest in a guillotine cutter. One you should take a look at is the Premier W12 Paper Trimmer from Martin Yale. Here’s a discussion of its strengths and weaknesses so you can decide if it’s right for you. The W12 has a very good cutting capacity for a guillotine paper trimmer. It can cut as many as 20 sheets of 20 lb. bond paper at one time so you’ll be able to get things done sooner. As you may have guessed from its cutting capacity, this device has an incredibly strong blade. It can not only trim paper, it’s able to slice through other materials such as mat board, some plastics, and more. The blade is made from hardened steel and is self-sharpening. This trimmer’s base has an alignment grid that contains both metric and standard measurements. The grid squares are 1/2” wide and the base itself is 3/4” thick. Its made out of solid wood so you can be confident that it’s very durable. There are rubber feet on the bottom so the cutter will stay put when you’re using it. The W12 has a 12-inch cutting length, so it’s perfect for documents that are 8.5 x 11” (letter-sized) and smaller. This trimmer would be great for office and school use, as well as crafting. Staying safe when using a guillotine paper cutter is important and the W12 has features to ensure you can finish the job without incident. There is a latch that will kick into gear every time you raise and lower the blade. Plus, the blade won’t fall without warning because it’s held in place by a torsion spring when it’s raised. And your fingers will be safe because this trimmer has a guard rail to keep them out of harm’s way. Using the W12 is not only safe, it’s also comfortable. The blade handle has a soft-grip coating that’s ergonomically friendly. Finally, this product (including the blade) is covered by a lifetime warranty. Since the W12’s cutting length is 12 inches, you can’t use it to trim large documents. Or at least you won’t be able to very easily. For example, if you trim a legal-sized sheet of paper (8.5” x 14”), you’ll need to cut it on the short side instead of the long one. This trimmer’s dimensions are 18.88″ (width) x 14″ (depth) x 3.50″ (height) so it will take up a fair bit of room. However, it only weighs 8 pounds, so it’s pretty lightweight. Basically, the Premier W12 would be a great choice if you’re in need of a smaller paper cutter with good safety features. This product is well-made, has both standard and metric grids, and the cutting capacity is great for this type of device. Plus, this trimmer has adequate safety features so every cutting experience will be productive and not dangerous. So if you need a guillotine cutter, be sure to give the W12 a look.